What happens when you cross a group of PHP developers with the ultimate festive snack? A sophisticated cross-platform, natural language, artificially intelligent chatbot, of course! 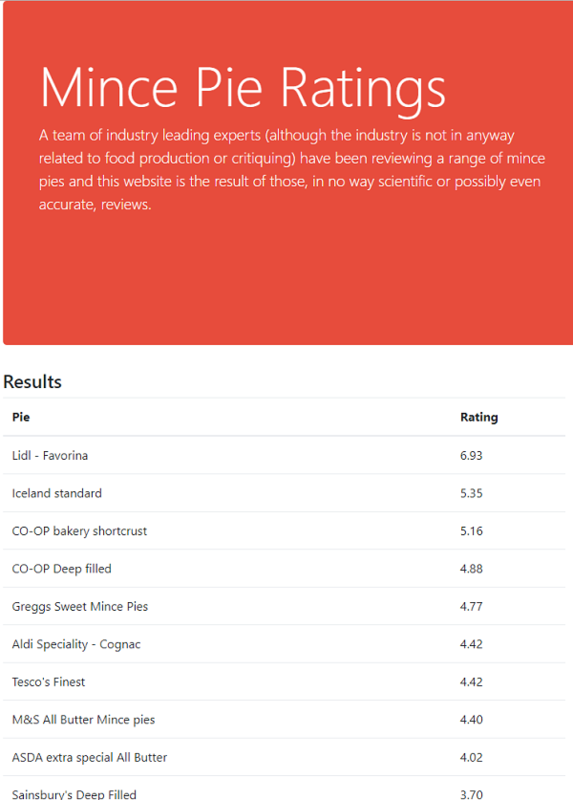 Discover how we created the ultimate mince pie rating system using a range of online tools. After work one November evening, we began debating which criteria are most important for a perfect mince pie – and how these should be weighted. We tweaked as we went along to align more closely with how we would rank the pies ourselves. With the pie algorithm in place, we needed data. 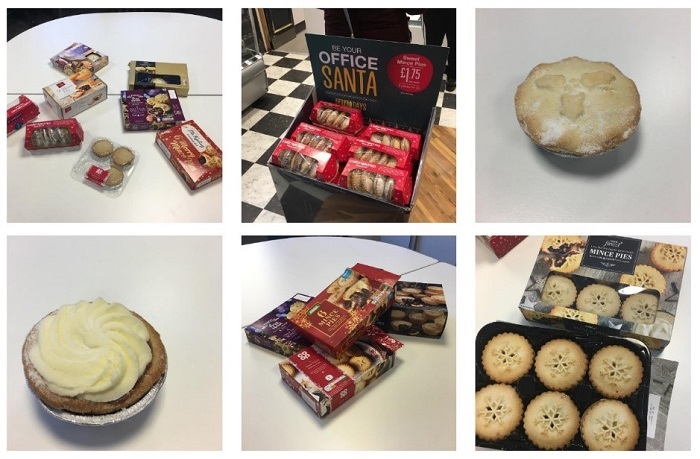 It was no time at all before pies started arriving on our desks – during the initial period, we were averaging as many as three pies per day. 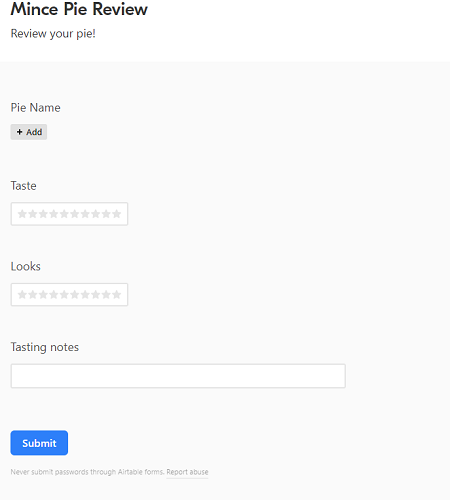 Using this form, members of the team could quickly and easily rate their pies. These ratings were then captured in an airtable database. Additionally, every time a pie was rated, a post also appeared on our @MincePieRatings Twitter account. We then set about creating a variety of applications to use the data, including a website, Slackbot and chatbot. The first application was a PHP website. 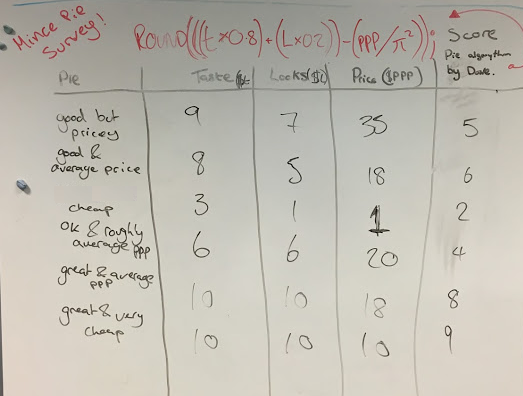 The data from the mince pie ratings is processed and output on the page in Pie Ranking Order (PRO), based on the MPA. Obviously, if you have a big decision to make about which mince pies you should be buying for Christmas, the above applications may not be enough! What you really need is something with some intelligence, something you can speak to as if it’s your friend. That’s where natural language processing comes in. 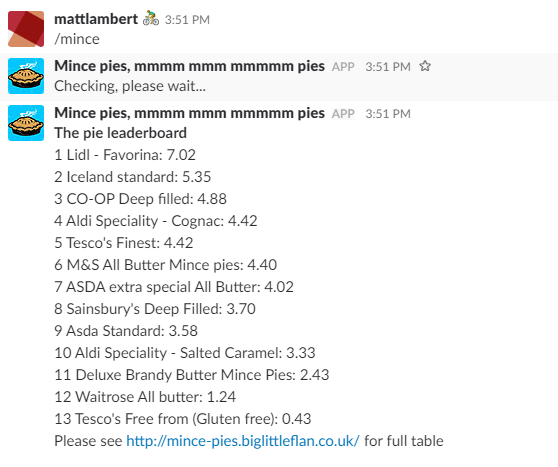 To accomplish this, our Development Director Dave used Dialogflow to create our new best friend: our very own mince pie chatbot. 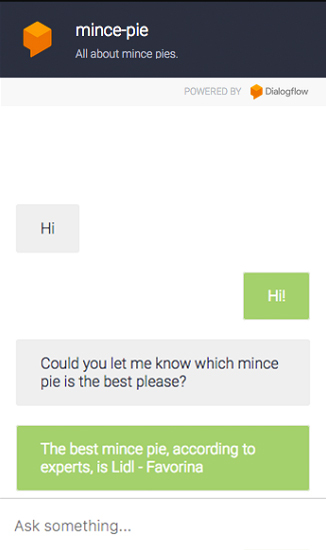 At the moment, this chatbot can be spoken to through Google Assistant as well as via the mince pie rating website. The same code could also be used to connect to Facebook or Twitter messaging apps. 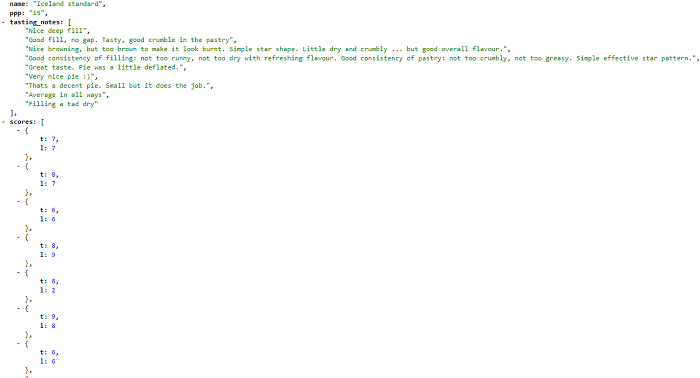 So although the project started out as a bit of fun, we managed to learn an awful lot from it. Oh, and if you were wondering – Lidl’s Favorina range of mince pies should be the pie that takes pride of place at your Christmas table this year.